Western blot analysis of extracts from OVCAR8 and Ramos cells, untreated (-) or λ phosphatase-treated (+), and from mouse and rat brain, using Phospho-PKC (pan) (gamma Thr514) (D6Y3D) Rabbit mAb (upper) and β-Actin (D6A8) Rabbit mAb #8457 (lower). Phospho-PKC (pan) (gamma Thr514) (D6Y3D) Rabbit mAb detects endogenous levels of PKC alpha, beta I, beta II, gamma, delta, epsilon, eta, and theta isoforms only when phosphorylated at a residue homologous to Thr514 of human PKC gamma. 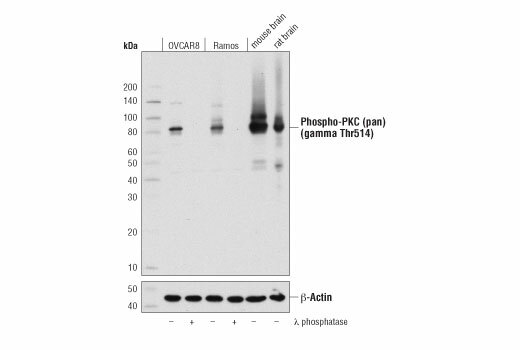 This antibody does not detect PKC phosphorylated at other sites. Monoclonal antibody is produced by immunizing animals with a synthetic phosphopeptide corresponding to residues surrounding Thr514 of human PKC gamma.